Sean Mahdi’s speech identified fundamental c hanges of the banking industry in the past decades. Building revenue heavily on financial leverage is no longer suitable due to increased regulatory intervention and industrial competition. A new business model is required to fully utilise digital technology to seize the opportunities among the customers, especially for those who have broadly interacted with the Internet. In order to have a better understanding of this challe nge, research has been conducted by PwC with almost 3000 banking customers across the major markets. 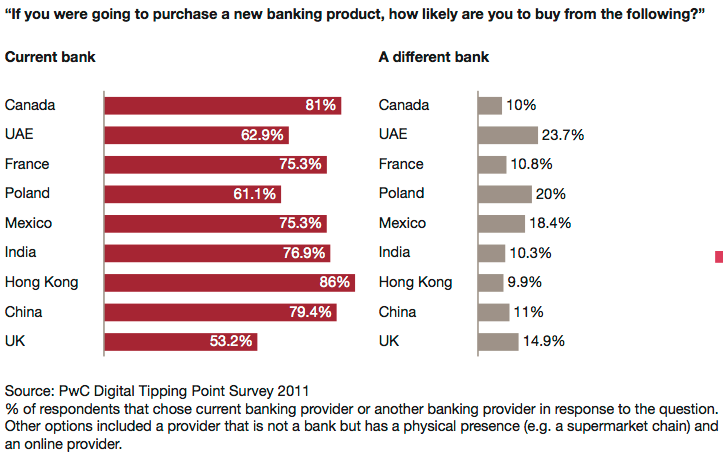 It demonstrates that the majority of customers prefer new financial services introduced by their primacy banks (see Figure 1). Due to the deteriorated public trust towards banks, this high level of consumer inertia will not be sustainable because of a concerted effort from regulators around the world to make the process of switching banks easier. In addition to this, the growth of mobile technology has implied a significant transformation of the traditional interaction model with those financial customers who require more location-based offers, timely and interactive content and more intuitive user interfaces. In particular, a better digital service is of considerable importance for those customers who have a high rate of mobile usage, now at the point of choosing their primacy banking providers. Sean Mahdi believes that implementing digital technology in banking will enhance customer engagement through much richer and broader financial offerings. This will initiate new business models, create new value propositions, redefine customer experiences and enable new potential among stakeholders. As a result of this, digital offerings can provide banks with extra revenue streams. Mr Mahdi’s team also tested the willingness of customers to pay for additional digital capabilities such as digital wallet, loyalty cards, social media notification, expenditure analysis, third-party offers and virtual vault storage (see Figure 2). The result reveals a very interesting fact that customers are willing to pay the perceived value of digital services, while banks currently are struggling to sustain their revenue and marginal growth. In the UK, 65% of respondents said they want to pay just over £4 monthly for converting accumulated points into cash and storage of loyalty cards information. This would contribute additional revenue of approximately £50 per customer annually. On the other hand, there is an increasing threat from new entrants, such as mobile operators, internet companies and small-and-medium size financial service providers. Mr Mahdi pointed out that although the new entrants can interrupt the patterns and dynamics in banking industry, it is unlikely that they could replace banks as the primary providers of financial services. According to Mr. Mahdi, the possible solutions for banks to address these issues could be developing a new strategy and vision by positioning customers at its heart, building a strategic partnership between a bank and an innovator in order to acquire and retain new customer, avoiding being displaced by obtaining first-mover advantage, or becoming a high-quality, fast follower. The winner will be those who can recognise the changes in the market and conduct a clear digital strategy for securing primary customer relationship.